The pleasure of a gentle bath & shower gel with energizing benefits. An instant boost of energy in the shower. Enriched with soothing organic aloe vera, zesty lemon oil and lively aromatic oil of Basil leaves, this shower gel gently cleanses and makes one feel energized. 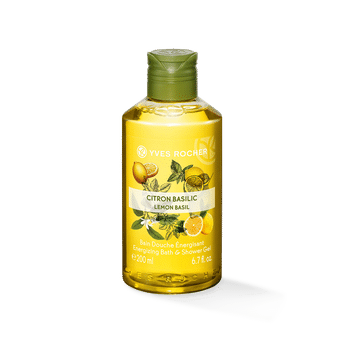 Formulated by Yves Rocher chain of experts, unique since 1959, this formula has Aloe Vera gel from Organic Farming and Lemon and Basil essential oils (in the fragrance) just for you. Skin is gently cleansed and delicately perfumed. Botanical-based ingredients: Aloe Vera gel from Organic Farming and Lemon and Basil essential oils (in the fragrance).